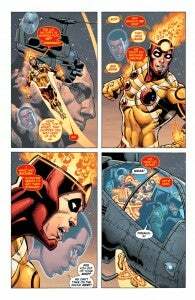 Firestorm Writer Jurgens: "Things Will Continue to Worsen"
Warning: Spoilers ahead for The Fury of Firestorm the Nuclear Man #17, out today. Check it out here and read it along with us. 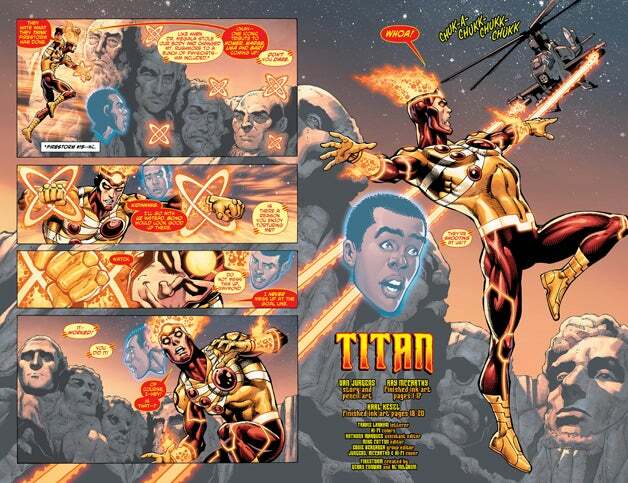 The Teen Titans are in town as Dan Jurgens tackles the next chapter in The Fury of Firestorm the Nuclear Man. 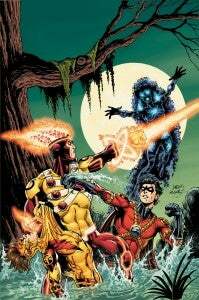 With Firestorm on Red Robin's radar, the teen heroes show up and, as is wont to happen when superheroes meet for the first time, a melee ensues. 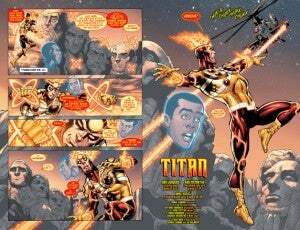 Dan Jurgens joined us to talk about the future of Firestorm, and the challenges of writing a one-off side story like this with the series' end coming on the horizon. You did promise us back when it happened that we'd see the resolution of the Mt. Rushmore thing. Do you think that, per the conversation they're having, the New 52 gives you some more room for one bad move to make the character a pariah, since there's so little history for the non-JLAers? My general theory regarding Firestorm is that, more and more, as the world begins to comprehend his power level, combined with what we've seen out of other versions of Firestorm, that he will be regarded as a potential threat. There comes a point where it's one thing to say you're a hero-- another thing to prove it. Until you save the world, a city, a school full of children or something that is easily recognized, people will doubt your claims. Obviously this is the first issue to hit since the cancellation of the series was announced. 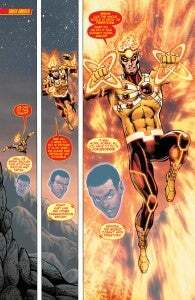 Did you know that Firestorm would be on Justice League before you knew there was no more Firestorm? Yeah, as I had always hoped we might be able to nudge sales in enough of a northerly direction that we could keep going a bit longer. Is the "We CAN do this" attitude from Ronnie bluster to keep his confidence up, or is he just that self-assured? That depends on who you ask. If you ask me, it's a bit of bluster. Ronnie, however, would say it's pure confidence. Why the difference? Because confidence as expressed by someone so young tends to be a very fragile thing. There's more bluster there than Ronnie realizes. You joke about putting the Simpsons on Mt. Rushmore--but did you know that The Simpsons already did a similar joke? Now that you showed the cover, I do remember seeing it. However, when I wrote the issue, it never occurred to me. I was looking for a reference common enough that everyone would get it. 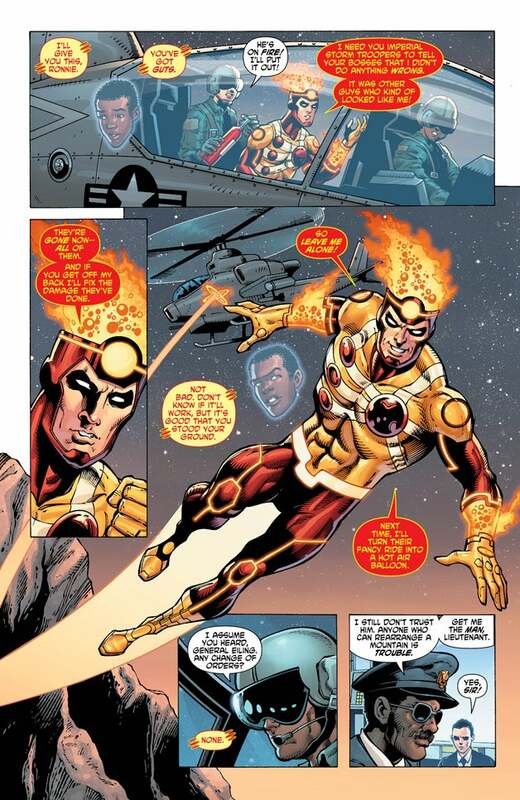 Good to see he got in and out with minimal trouble, but does it really help Firestorm's cause to trespass on an aircraft mid-flight when that's one of the charges against him to begin with? Again, that's youth. The decision a high school kid might make is not the decision Superman would make. And what would be more kid-like than simply saying, "Well, I'll just go jump inside that helicopter and tell those guys to leave me alone 'cuz I'm a good guy!" 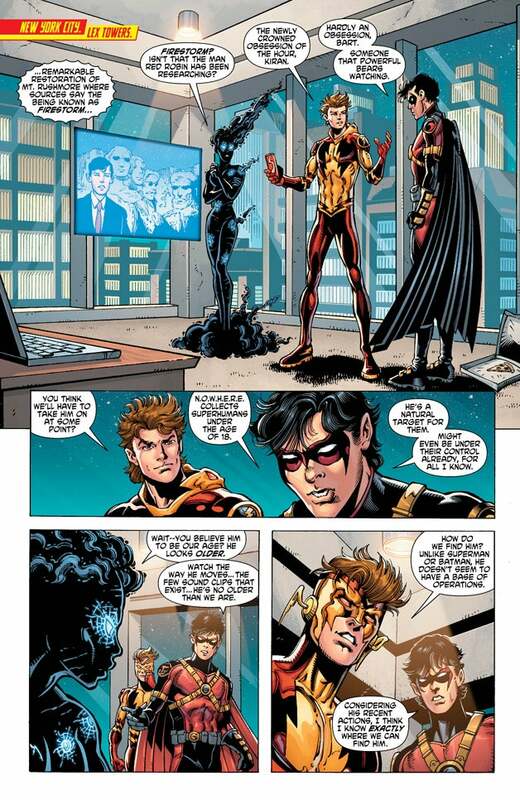 Obviously it's been a while since you worked with the Titans--and when you've done so in the recent past, it was in Booster Gold, where you didn't have to worry about treading on someone else's continuity. Is it a bit of a challenge to have to juggle a guest appearance like this with characters that Scott seems to have locked in a loop of big events? Not really. I've known Scott a long time and we tend to be a cooperative bunch these days. The Titans crew was very helpful in helping us out. Is being hungry a result of the Firestorm activity or just because they've been running non-stop for however long? More because of they've been going non-stop. Plus, my experience has always been that teenage guys are always hungry. It seems to be a recurring motif in your work that nobody ever gets to stop to eat! I think Booster Gold is STILL waiting on that pizza. Guessing that it's just Mama Raymond who goes without today, though, right? Exactly. But it's one of those overlooked things in comics. When do these guys eat? When do they drink? That's why I always wanted to do the story where those cylinders on Green Arrow's belt end up being water. And a beer or two. I hadn't thought of it, but have we ever established whta happened to Ronnie's dad? With Felicity Smoak (his onetime wife) taking on a bigger role in Arrow next season, it might have been a nice opportunity for some synergy if the book had been around that long. It was established quite early that Ronnie's father had walked out when he was younger. I had mapped out something very specific in terms of what his fate might have been and where he currently is. Apparently Tonya doesn't get the first rule of cheating: To avoid getting caught, you have to make sure you sound at least a little bit like the person you're cheating for! It's odd: In a situation where you're a guy with godlike powers, it almost makes sense that if you can fix your damages the authorities should give you a bye...except that seems like a really lax policy, since obviously encouraging Firestorm to just do what he needs to do and make up for it later could lead to a situation where people are in danger. True. Plus, how many times have we seen heroes damage something without ever trying to fix it? How many times has Hero A ripped a light pole out of the street in order to whack a bad buy with it, yet never tried to address the problem later? It's kind of rare that we actually see someone go back in attempt to make things right. Given how intelligent Tim is, it's a big leap from "he might already be working for them" to "ATTACK! He's a bad guy!". Was that just a matter of being overly cautious or was it more like you didn't have the page count you needed to fill in those blanks? No, I wouldn't blame anything on a lack of pages. That'd be bad writing. I think it's reasonably clear that Kid Flash dropped Firestorm in a pond so they could talk. It was Firestorm who then lashed out, thus elevating things. This is the first time you've had a chance to draw most of these characters in the New 52, right? Is there a different approach you take to Tim Drake now as opposed to before? He looks a bit more like Nightwing than he has in other issues you've drawn. Think so? Probably some elements of personal style. You know, if DC had a Marvel-style AR app, that splash page could have been really cool in 3-D. Nice use of perspective and light. Brian Miller and his Hi-Fi crew came through again-- just as they always do. They're great. What was the idea behind this cross-over? Was DC entertaining putting him on Titans? Was it just in hopes of a sales bump for the tie-in? A sales bump is always hoped for. As I've said many times, we don't do comics designed not to sell. But it's also about telling a fun story and I think we all got on board with the idea that the Titans and Firestorm should meet. That's part of the fun of having a new universe. Mrs. Schmidt seemed pretty unfazed by the whole thing...was the contest even real? Was that something she was using to smoke out the cheating? No, I'd say the contest was real. I just find her to be a truly humane teacher who understands that teaching can mean a lot of things that go well beyond the strict rule of the classroom. Well, I can say this for the cliffhanger--at least it's a reason that he can give the school for not getting that paper done. With the blood and bullets, it's not as though he can really hide what happened. Exactly right! Things will continue to worsen!